Rural hubby has a new hobby of late, which I can only pin on myself for starting as I’ve begun to drag him from winery to winery in Kentucky- a quest for the “best” Blackberry Wine. Hubby grew up eating wild blackberries (and for those of you who are city folk, there’s a substantial difference between the plush blackberries you find in the supermarket and the ones that grow wild on vines buried in the marsh of our back pasture) so while he likes “sweeter” wines, he’s looking for that tang. The bite that comes from a sun-ripened Kentucky native blackberry fresh off the morning vine. This is no easy task, by the way, on a frugal budget as we are looking for the best “cheap” Blackberry Wine… which may eventually evolve to taking a stab at homemade wine. 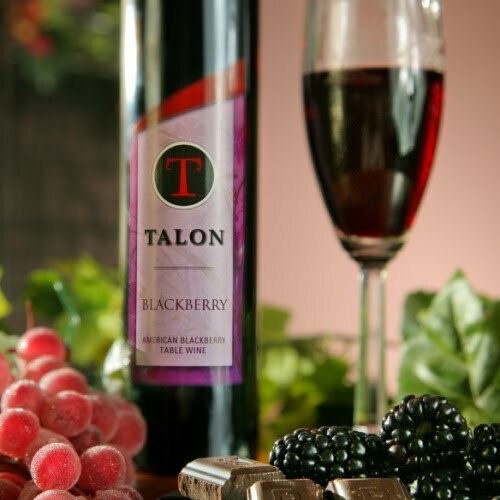 Our first taste- that led to this fun quest- was at Talon Winery (Shelbyville, KY) Talon produces 100% Kentucky wine using only Kentucky Oak barrels, but we found out they import their blackberries from other US states. I’ll forgive them this a) because we Kentuckians are not apt to part from our precious wild blackberries and b) their Talon Blackberry Wine is wicked-good. I rather enjoy the hearty blackberry goodness of the Talon Blackberry wine, but though it has tang, it’s still a little sweet for my Merlot-loving taste buds. A great dessert wine. Hubby, however, is hooked on this one. Next up, we found our next sampling at Simmons Winery (Columbus, IN.) Their Simmons Blackberry Wine is a sweet table wine with kick. Great blackberry flavor with no stick-sweet aftertaste, this is a easy-on-your-palette wine that could easily be enjoyed with a meal or double as a mellow dessert wine. We stumbled on our next try at a local store, Purple Toad Lauren’s Blackberry Wine (Paducah, KY,) and of course, had to buy this one just because of the interesting name of the winery and the very cool frog on the label. Made with Kentucky blackberries (hurray- someone spared some for this nummy wine!) Purple Toad Lauren’s Blackberry Wine has all the bite you’d expect from Kentucky blackberries, and not as much sweetness as we found in the other wine. We found this wine to be best served chilled. At room temperature the “bite” is near bitter, when chilled it’s a very pleasing, smooth table wine. Stay tuned for our further Blackberry Wine adventures. If you have one to recommend, please do, we’ll add it to our “to try” list. Found this via a Google search, and realize I’m awfully late from the posting date, but I must suggest Del Monaco Vineyard’s Blackberry Table Wine. Del Monaco is located in Baxter, TN (may sometimes be listed as being located in Cookeville, TN). The vineyard is lovely, and the Blackberry Wine is my absolute favorite wine! I live in Carroll County, Kentucky and I cross the river to pick up “Blackberry Social” from the Lanthier Winery in Madison, Indiana. It’s on Mill Street down by the Ohio River, a block west of the Lanier Mansion. It’s my favorite wine to date. I buy it by the case. I don’t know anything where the Blackberries come from. But it’s a very mellow taste with no bitterness. Madison is a lovely place to visit if you haven’t been there. The old town down by the river hasn’t changed much in 50 years while all the Walmarts and fast food places are on top of the hill. I recently visited Belle Mead Plantation in Nashville, TN and their blackberry wine is awesome! I purchased three bottles. It is sweet at the beginning but finishes with a warm, warm feeling. I like it with pasta. Blackberry is my favorite wine and could recommend several KY wineries that offer a good blackberry, including Prodigy Vineyard and Winery in Woodford County, KY and Rising Sons Home Farm Vineyard and Winery in Anderson County, KY.
You must try the blackberry wine from Ladoga Ridge winery in Smithville, MO. It’s just north of Kansas City. I moved away last year, and haven’t found another blackberry wine that holds a candle to Ladoga Ridge.